MANILA, Philippines (AP) — The Philippine navy extricated one of its largest warships from the shoal where it ran aground last week near a hotly disputed region in the South China Sea. Two Philippine security officials told The Associated Press early Tuesday that tugboats were used to pull the BRP Gregorio del Pilar from the shallow fringes of Half Moon Shoal, which the Philippines calls Hasa Hasa, before midnight. The military later confirmed the successful extrication. Philippine defense officials notified their Chinese counterparts after the accidental grounding of the Philippine Navy frigate at the shoal, which Beijing claims, to avoid any misunderstanding, said the two Philippine officials, who spoke to the AP on condition of anonymity because they were not authorized to discuss the issue publicly. At least four Philippine Navy and Coast Guard ships were deployed to secure the BRP Gregorio del Pilar and provide food and other supplies to its sailors. Tugboats were hired to extricate the ship and tow it to a Philippine port for repairs, military spokesman Col. Edgard Arevalo said. 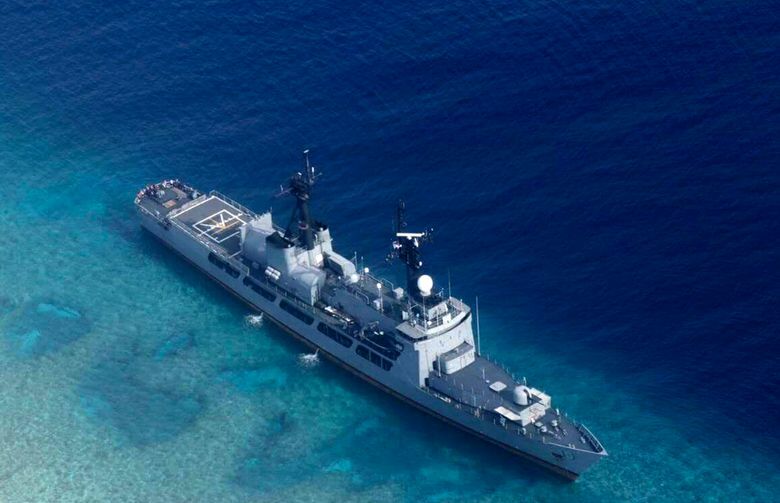 The frigate is one of three former U.S. Coast Guard cutters acquired by the Philippine military and now are the Philippines’ largest warships. The United States and Asian governments which have claims in the disputed sea, including the Philippines, have raised alarms over China’s island building and militarization of the strategic territory. The Philippines has been one of the most vocal critics of China’s assertive moves in the disputed waters. In 2016, it largely won a complaint it lodged before an international tribunal, which invalidated Beijing’s sweeping territorial claims in the South China Sea. Philippine President Rodrigo Duterte, however, took steps to revive once-frosty ties with China after he took office in 2016 as he sought infrastructure funding and more trade and investment from Beijing.